Founded in 2009, Culture Days is a non-profit organization dedicated to building a national network of cultural connections devoted to providing Canadians with opportunities to participate in, and appreciate, all forms of arts and culture. MIA joins this collaborative initiative with our 3rd annual Inuit Art Identification Clinic. 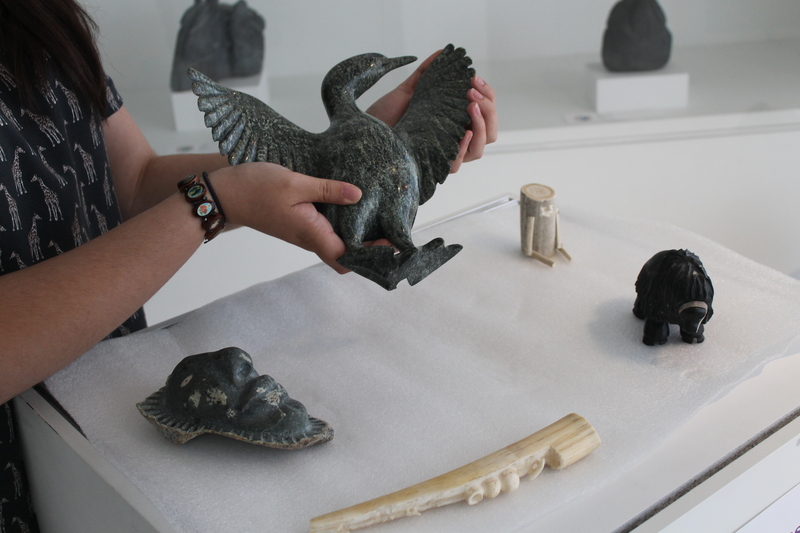 Members of the public are invited to bring in a piece of Inuit art from their personal collection to have it verbally appraised by a panel of experts. MIA is pleased to welcome back the wonderful Blandina Makkik for her second year on our all-star panel of Inuit art specialists. Blandina is an excellent addition to the panel with her keen eye for spotting signatures and her intimate knowledge of Inuktitut. You won’t want to miss the opportunity to have such an experienced professional examine your own precious artworks! Blandina Makkik was born and raised in Igloolik on the northwestern coast off Baffin Island, Nunavut. Previous to joining the team at the Craft Ontario Shop, she served as a Land Claims Implementation Advisor for the Government of Nunavut. She has also worked as an Advisor for the Department of Foreign Affairs and International Trade where she traveled extensively throughout the Circumpolar world. From 1985 to 1991, Blandina was the Senior Producer for Inuit Broadcasting and developed the first children’s television programming available in Inuktitut. The program, Takuginai (Look and Learn) won numerous awards internationally. 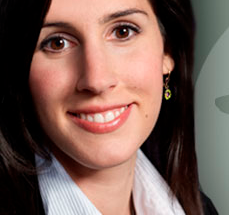 Blandina joined Craft Ontario in 2005. She has her International Baccalaureate from Lester B. Pearson College of The Pacific and has also attended Trent University, McGill University and St. Francis Xavier University. This year we are pleased to have Christa Ouimet return to our all-star panel of Inuit art specialists. Christa has been a panelist every year since our inaugural event in 2013. Christa is an integral part of Katilivik – an indispensable resource for staff at MIA. Check it out next time you are looking to identify an artist – you can search by name, community, disc number, or even syllabics! As Managing Director of Waddington’s Inuit art Department and Fine Art Specialist, Christa’s extensive knowledge and experience has earned her reputation as one of the world’s leading experts in Inuit Art. Her 15 years in the Canadian art auction industry has culminated in the handling of over $2 million of Inuit art a year. In addition to auction sales and appraisal consultation, Christa provides an educational service through a free web based platform including identifying artists, dating sculptures, evaluating and providing biographical information. 2003 saw Christa’s first major contribution to Waddington’s when she added a spring auction in addition to the annual fall auction of Inuit Art, at the same time she was able to pursue her desire to promote Inuit works on paper as the sole focus of her inaugural spring catalogue. Waddington’s spring Inuit Art auction continues to be an anticipated event and a fixture in the Waddington’s auction calendar. In 2007 Christa spearheaded Waddington’s online auctions offering an additional selection of Inuit art every month. Online auctions are now a successful addition to all of Waddington’s specialties. Christa has developed partnerships for promotional events in correspondence with Waddington’s biannual Inuit art auctions with esteemed organizations such as, Adventure Canada, McMichael Canadian Art Collection and BirdLife International. 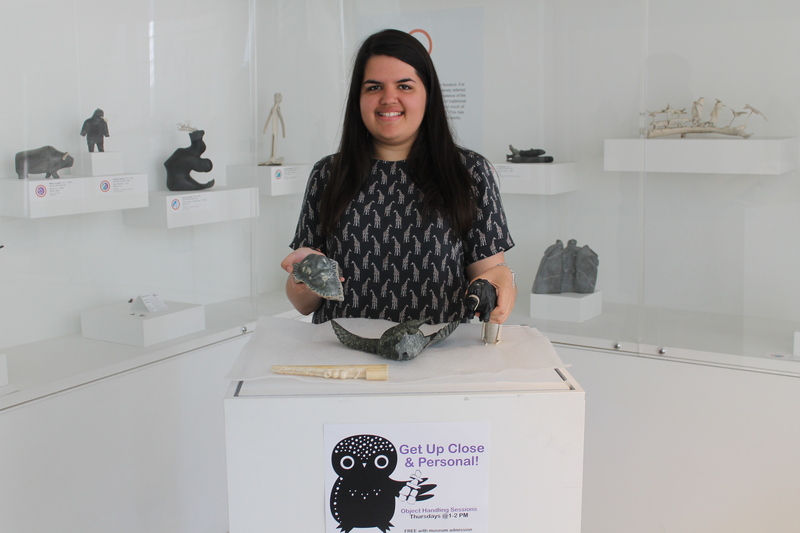 Christa enjoys being a regular panelist in the Museum of Inuit art’s (MIA) annual appraisal clinic. Goodbyes are never easy, and this week at the Museum of Inuit Art (MIA) is no exception. The time has come for me to finish another summer of work here at the Museum of Inuit Art, and I must say, it’s just as difficult the second time. As you can imagine, I’ve grown quite attached to the MIA. I never expected that I would get the chance to work here for two summers in a row, but I’m so grateful I did! Back in May 2014 when I started my first Young Canada Works position as Visitor Services Officer, I had a lot to learn about museum work. My knowledge has drastically increased since then, as I’ve had the opportunity to fill various roles during my time here, such as conducting a visitor evaluation, processing admissions at the front desk, giving tours and promoting MIA at local arts and culture festivals. I would like to thank all the volunteers who helped out with all the out reach sessions we attended. It was so great to meet people who were interested in learning and sharing knowledge about art and history. It’s so inspiring to see community members giving back by lending their time and experience. I would also like to thank all the visitors that came out to the programming – both on and offsite of the museum. It was great to put into practice what I had been developing behind the scenes. Through interactions and testing I was able to adapt some new activities and make them even better for the next group of curious museum seekers. And last but not least I would like to thank MIA staff for welcoming me back, and for making this summer such a wonderful experience. I’ve learned even more about museum work and programming, and after venturing all over Toronto with our outreach team and special events volunteers, I’ve been able to see the museum from a different perspective. Bringing objects from MIA’s Educational Collection to Toronto Public Library branches and local events opened my eyes to the many outreach possibilities in the city, and I’m grateful to have been a part of that. Even though I’m leaving at the end of another rewarding summer, I look forward to visiting the museum again soon – I’m especially excited for the Abraham Anghik Ruben exhibition this fall! I am so fortunate that I’ve been able to gain experience in my chosen field, and I couldn’t have asked for a better place to work. Thanks again, MIA! Get Up Close and Personal: Please DO Touch! Over the past few weeks, Serena -the museum’s Summer YCW work intern, has been developing more interactive programming inside the museum. After brainstorming, researching, testing and training volunteers she was able to launch Get Up Close and Personal to share art works directly with museum visitors. Read about her experience creating the new program below. Keeping museum pieces secure and safe from harm is a priority at any museum or art gallery. No museum is complete without a large sign or two saying “PLEASE DO NOT TOUCH”. However, if you’ve been to MIA in the last couple of months on a Thursday afternoon, you may have had the chance to participate in our new Get Up Close and Personal sessions. These interactive sessions offer visitors the unique opportunity to touch objects from the MIA Educational Collection. Pieces in our Educational Collection are meant to be handled, so visitors can feel free to pick them up and learn more about the texture and material of each object. I’ve been running these weekly Get Up Close and Personal sessions since July, and the results have been overwhelmingly positive so far. Visitors enjoy engaging in this tactile experience and trying to guess what material each piece is made of based on its texture. Serena is all set to go for ‘Get Up Close and Personal’. You can join a session every Thursday from 1-2 PM in the museum. It’s quite interesting to see how visual appreciation of the works in the museum translates to visitors’ tactile experiences – I often ask visitors to feel the porous texture of the antler doll in the collection and to guess what material it is made of. The most common answers are “bone” and “wood”, so most visitors are surprised to learn that the doll is made of antler, which caribou shed every year. It has been especially rewarding to see how visitors make connections between what they have already seen in the museum and what they are holding in their hands. Once visitors find out that the carved ivory piece is a walrus tusk, many of them mention the narwhal tusk and the small ivory sculptures in the historical case at the museum. 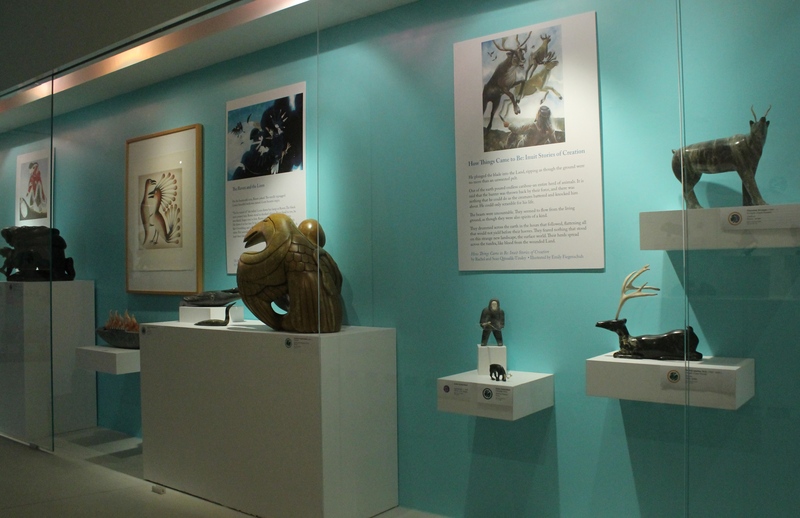 Pieces from the museum’s Educational Collection that reflect the different types of materials and textures you can find in art produced by Inuit. These interactions with visitors are part of what makes working at MIA so fulfilling. 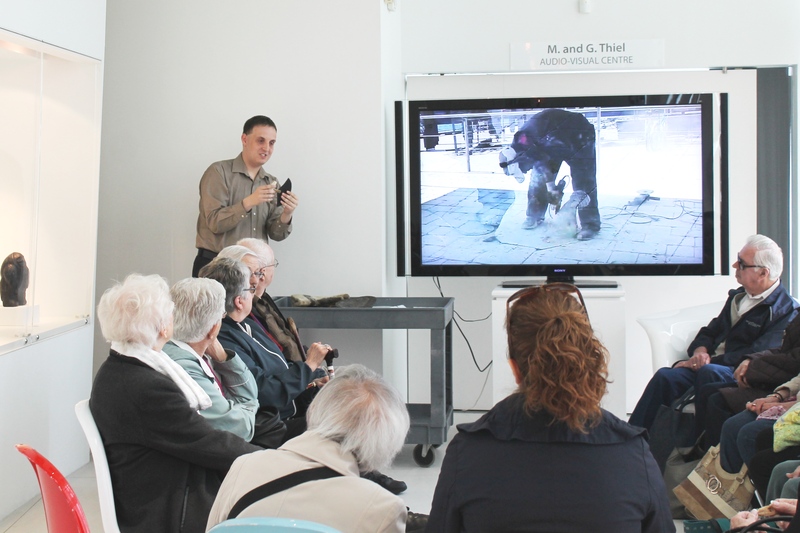 I love contributing to visitor learning and watching visitors discover more about Inuit art. If you’d like to see (and touch) these objects for yourself, be sure to drop by the museum on Thursdays from 1-2 PM! After a blur of summer events at the museum, and the extravaganza that was the Pan Am games, it’s hard to believe that August is already on its way. Over the last two months I’ve been lucky enough to participate in outreach events at the Toronto Public Library, Party on the Promenade and most recently, the Aboriginal Pavilion at Fort York; and yet, we still have more events planned for the rest of the summer at MIA! Planet IndigenUS is a 10-day festival promoting aboriginal arts and culture, and MIA will be celebrating alongside (literally – their building is next door) the Harbourfront Centre! From July 31 to August 9, events will take place at locations such as museums, libraries and art centres both in and around the GTA. As part of Planet IndigenUS the museum will be offering three types of programming focusing on the theme of “Seven Generations” – how the actions we make in the present affect future generations. Just when you thought it couldn’t get any better: both tour options are free with admission! Join me and other docents from the MIA Volunteer Team for a guided tour of the museum’s permanent collection. Between August 4th and 9th we arehosting two tours a day, one beginning at at 11 AM and the second starting at 1PM. We love showing visitors around and sharing the stories behind some of our most popular pieces. Alternatively, if you prefer wandering at your own pace, we’ll also be offering a special self-guided tour for the duration of Planet IndigenUS. Simply follow the Planet IndigenUS feather icon found in our display cases to learn more about the pieces we have on view. But that’s not all we’re doing for Planet IndigenUS this summer. If you’ve never had the chance to check out Inuit throat singing before, now’s your chance! MIA is thrilled to be hosting Sylvia Cloutier, a well-known Inuk throat singer from the Nunavik region, on August 8th at 6PM. Sylvia’s live performance will take place in the museum and will be followed by a Q&A session where guests can find out more about Sylvia and her work. Tickets can be purchased online, in person at the museum, or by calling (416) 640-1571. I feel so fortunate to be involved in so many different events promoting aboriginal art and culture, and I’m excited for these upcoming activities. Planet IndigenUS is another great opportunity to celebrate the diversity and unique talent of aboriginal artists. Planet IndigenUS is sure to be an amazing 10 days – come celebrate with us! It’s hard to believe I only arrived at the museum two months ago, and that my internship is almost over. Everyone here has made me feel so welcome; it’s made my internship just fly by. So much has happened in that short period of time that it’s hard to fit everything into just a few paragraphs. To cover some of the main points, while I’ve been here I’ve gotten to apply everything I learnt in school to actual situations. I’ve had the opportunity to catalogue and condition report objects, to transport object, and to pack and store objects – all things I’ve learnt theoretically but seldom in practice. I have gotten to grow, to learn, and to be confident in my opinions and ideas. Myself and the MIA Collections Manager preparing some works on paper to be returned. Being able to state my opinions and ideas with confidence is the most important part of this internship for me, and it is what helped make our newest exhibition Unikkaaqtuat: Inuit Creation Stories a reality. When I first started I was asked, somewhat in passing, to think about what a new exhibition could be. There were a few options, but nothing stood out to me except finding a way to explore Inuit myths and legends. I did not know much, but I was eager to learn more. That’s how I began the research for this exhibition – by reading a wide variety of myths and legends, and I started with Inhabit Media’s “Unikkaaqtuat: An Introduction to Inuit Myths and Legends.” As soon as the idea solidified I emailed Inhabit Media, and got great feedback from their organization. I got to choose some of my favourite stories, and with MIA’s Collections Manager I got to look through the museum collection to find objects to accompany those stories. Together Lauren and I narrowed down our list, and chose objects to best reflect the stories. From that point on it became a matter of organization. Which stories would go beside each other? Which objects look best when paired together? What can we do to create the best impact? We planned this exhibition to be as family-friendly as possible, to add colour, lower plinths, and create interactive components to help entice parents to bring their children to the museum. Objects and text panels were placed lower on the wall to help children interact with the objects. We’ve even added a LEGENDary Theatre so visitors can use puppets to act out the stories they’ve read in the exhibit or share their own stories. There are five different stories represented in the case, each accompanied by art from the MIA permanent collection. As the exhibition planning and execution continued to progressed, it became obvious to me that this would become an exhibition with a selection of some of my favourite stories, and objects. From light and humorous to dark and frightening, this exhibition explores different stories of how things came into existence. Following the opening more programming, tours, and art activities will connect with the show and I hope you have a chance to see it this summer. Introducing Our New Community Engagement Intern! Thank you for visiting the Museum of Inuit Art Blog. Please note that with the closure of the MIA in May 2016 this blog will no longer be monitored. Please feel free to use the provided content for educational and personal use. Looking For Your Playing Favourite? Playing Favourites have moved! They can now be located here. All text and images are copyright Museum of Inuit Art unless otherwise noted.